Designed for use on the injector return side of a common rail diesel system, Laser Tools’ Diesel Injector Flow Tester measures the return fuel flow on engines up to ten cylinders. The extra cylinder capacity is very useful on certain commercial and marine applications. The Diesel Injector Flow Tester assists with the diagnosis of poor (or no) engine starting, rough running, overall lack of power and excessive smoke. A faulty or partially blocked injector will send excessive fuel back to the fuel tank (also referred to as ‘back leakage’). Running the engine for just a few seconds with the injector return flow tester fitted will show up a faulty injector by reading a higher level of fuel in the graduated fuel chambers. The Diesel Injector Flow Tester is very easy to fit. All the mechanic has to do is pop off the return pipe connectors on the injectors and substitute with the fuel lines from the tester. 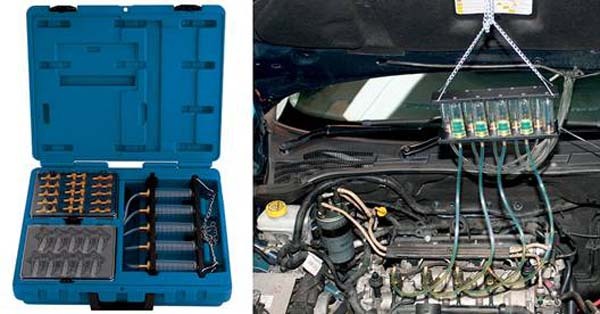 This very comprehensive kit includes adaptors (ten of each) for Bosch, Siemens, Denso and Delphi common rail injectors. Check your local supplier for the best prices and special offers.